The world's worst designed stamps were printed in large quantities and miserable looking specimens can be found in every old collection of Russian stamps. There are just five values, though you need a magnifying glass to find out what the values are. Philatelic covers are reasonably common but examples of genuine postal use are very rare. Alexander Epstein has tried to make an Inventory of known examples. A few years ago, I was able to add one to his list. This Kerensky stationery card has a 10 kop Imperial Arms stamp added to it and then a 5 kopeck OKCA stamp. They are cancelled POLNA S P B [St Petersburg] 2 10 19. 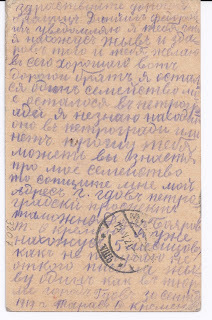 But we know from the researches of A Epstein that this Imperial Russian Polna cancel was actually being used in Gdov at this time - and the text of the card confirms this - the sender is very much in Gdov for he ends his message "I have already been here 5 months and have still not received a letter from anyone. I feel like I am in prison in the town of Gdov. 1919 Taras O. Kremen"
So far so good. 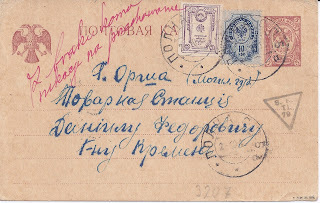 The card is addressed to Orsha in Mogilev guberniya (modern-day Belarus). The small triangular cachet on the front is a known Estonian censor mark and confirms what is already believed, that mail from towns held by the anti-Soviet Northern and North Western armies was generally routed "back" through Estonia. Good day, Patsits Diu ... Fedorovich. I want to let you know that I am alive and well and that I hope that all is well with you. Dear Brother, I am now alone. My family remained in Petrograd. I don't know if you are now in Petrograd or already somewhere else. Can you please find out some news about my family. 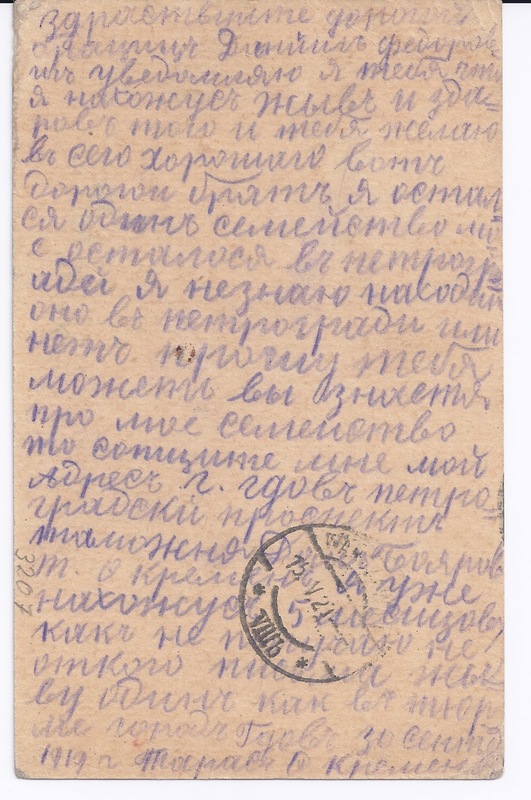 Then please write to me at my address: Town of Gdov, Petrograd Prospect, Customs [?] D... Bojarov, T.O.Kremen"
- after which he concludes with the passage I have already quoted. What happened next? 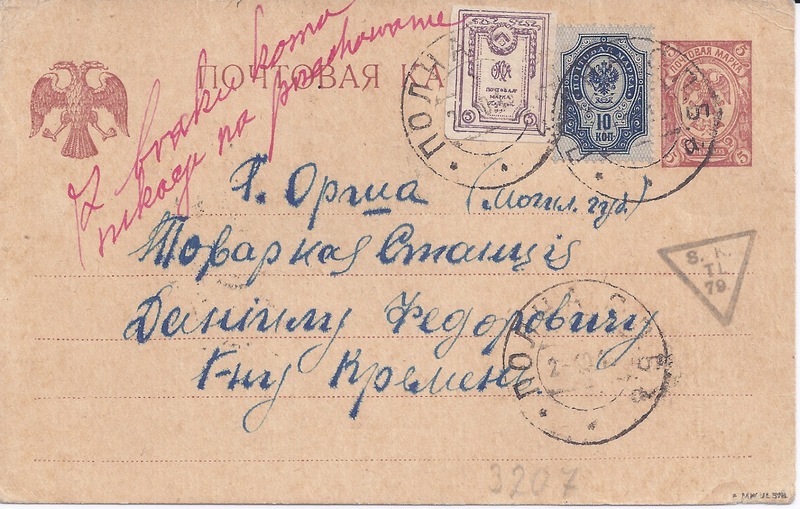 On the reverse of the card is another postmark: WARSAWA VIIIb, 15 V 21.